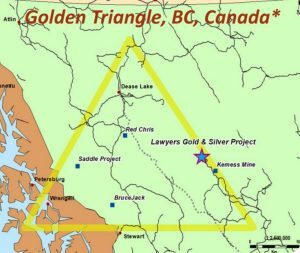 BRITISH COLUMBIA – Benchmark Metals of Edmonton has the results of drilling at the Dukes Ridge zone at the Lawyers gold-silver project in the Golden Triangle. The holes intersected wide intervals of near 1 g/t gold equivalent and narrower intervals of high grade gold and silver mineralization. Benchmark says it has traced more than 3 km of continuous mineralization along the Lawyers Trend. The trend covers the Cliff Creek, Dukes Ridge, Phoenix and Phoenix East zones. Drilling at Dukes Ridge in 2018 returned a best assay of 52 g/t gold and 846 g/t silver over 3 metres within a larger interval of 33.52 metres that graded 5.8 g/t gold and 128.7 g/t silver. The Dukes Ridge zone might be mined using bulk tonnage methods. The zone remains open. The zone has a resource estimate of 58,000 tonnes at 4.30 g/t gold and 139.13 g/t silver. Cheni Gold Mines briefly mined the Cliff Creek, Phoenix and AGB zones from 1989-92. Dukes Ridge has not been developed. More information is available at www.BenchmarkMetals.com.